With my very own FOB. Incidentally, I'd never seen the original before - just the Steve Martin remake - and this might be the first time ever when I actually enjoyed a film and its remake equally. I mean, I probably do prefer the remake, just because the humor resonates a bit more (and I do love Steve Martin), but there's a lot that the remake flat-out stole from the original. That makes the original get a lot of the credit for some truly timeless gems. 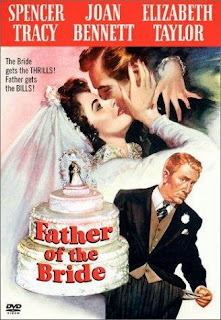 However, the tagline of "The Bride gets the THRILLS! Father gets the BILLS! ", well... maybe not. And the whole going-from-her-father's-home-and-keep-straight-to-her-husband's, well... hey. Even the parents of the bride had separate beds in the original (thanks, Hayes Code! ), so at least it's dated across the board.